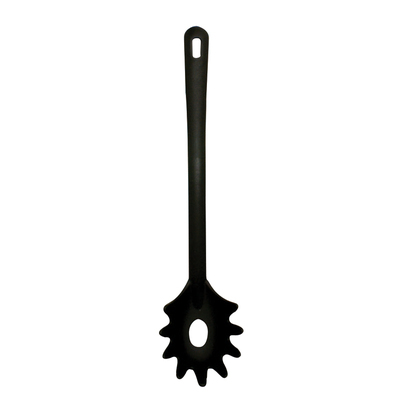 A highly functional cooking tool, our Black Nylon Spaghetti Server has been designed as the perfect tool for serving spaghetti or pasta while also featuring a hole in the centre for measuring a single serving of spaghetti. This lightweight tool has been constructed from Nylon and promises heat resistant service, reducing the risk of injury while in use. The long handle keeps hands away from boiling liquids while the small hook at the end allows it to be stored on the wall, freeing up space for additional cooking or serving. Suitable for both dishwasher and hand washing and designed to leave no flavour taint in your food.